Part 30: Hey Barricade, Who’s in Charge Here? Initial skirmishes on the barricade, the first deaths, Marius’ suicide mission, Gavroche pushing things a bit too far, and Valjean reaching another crisis point. The soldiers really do ask “Who’s there” and Enjolras really does respond, “The French Revolution!” Now I feel like an idiot for thinking it shouldn’t be in the movie. Of course, now that I’ve read up to this point, it’s clear that the ABC Society feels like they’re the heirs to the original revolution, keeping its spirit alive. 80-year-old Pere Mabeuf has been sort of lost in his own little world since he arrived, talking silently to himself and not noticing events around him. But when the first hail of bullets hits the barricade, stunning the rebels and knocking down the flag, he stands up, walks over to Enjolras, picks up the flag, and climbs the barricade. “Long live the Revolution! Long live the Republic! Fraternity, Equality – and Death!”…with predictable results. Marius to the Rescue. No, Really! And then Marius rushes in, guns blazing. The fact that he has two is important, because he doesn’t have to stop and reload. One shot saves Courfeyrac, the other Gavroche. Who the hell knew the “little nincompoop of a lawyer” could aim? It’s only a few seconds, but it’s enough of a reprieve to rally the group, and they hold out long enough for Marius to grab a full powder-keg and threaten to blow the whole place sky-high — rebels, soldiers and all — if they don’t retreat. Since he actually wants to die, they take him seriously and run like hell. Jean Prouvaire dies next, captured in the melee. They’re just about to trade Javert for him, when they hear him shout, as the chapter title puts it, his last poem: “Long live France! Long live the future!” — then a gunshot. It’s reminiscent of how Javert doesn’t get executed later on. One of the things that I always wondered about is why the army didn’t just go around and come at them from the other side. Hugo actually addresses this as “a peculiarity of this type of warfare” and the risk of getting trapped in narrow, winding streets. I guess it depends on where you build it. There’s something to be said for making your own battleground. Marius is trying to absorb what’s happened, when he hears his name and sees a shape crawling along the street toward him. It’s Éponine, who, as it turns out, had just saved his life by thrusting her hand in front of a gun that was aimed at him, deflecting the bullet. I can’t help but picture her dragging herself along the ground like the Terminator skeleton at the end of the first film. “What are you doing?” “I’m dying.” Eh, give him a break. He’s not very observant. I don’t think it’s raining at this point, but it has been off and on all day. Any hope Marius had of focusing on the rebellion is now gone, just minutes after being appointed leader. Ashamed by his failure to protect Thénardier’s daughter, he sets upon a scheme to save her brother and bid a proper farewell to Cosette at the same time by sending him as a messenger. Gavroche only agrees because he figures he’ll have time to get there and back before the fighting starts. So much for that idea. “Man the individual is a deeper being than man in the mass.” In mass they’re dumb, panicky animals and you know it. Ah, that makes sense: the “inseparable” box contains the child’s clothing that Valjean bought for Cosette way back when he rescued her from the Thénardiers. At the point Gavroche reaches the remote house in the Rue de l’Homme Arme, Valjean has just spotted the blotting paper which Cosette had used when writing her note to Marius the day before. He goes into full papa bear mode…but he’s also deathly afraid of losing the one thing that’s made his life have meaning, as he hasn’t been able to love anyone other than Cosette. “For the first time in their life together her wishes and those of Jean Valjean had shown themselves to be separate matters.” Not the first time they’d been separate, but the first time he’d noticed. We cannot be said to read when in a state of violent emotion. Rather, we twist the paper in our hands, mutilating it as though it were an enemy, scoring it with the finger-nails of our anger or delight. Our eyes skip the beginning, hurrying on to the end. With a feverish acuteness we grasp the general sense, seize upon the main point and ignore the rest. True. And yet it contradicts the statement made during Marius’ dilemma about reasoning calmly and detached even under great stress. Valjean is relieved to realize that the boy threatening to take Cosette away from him will soon be dead. Yaaay! Strangely, we step out of Jean Valjean’s head just before he decides to leave for the barricade. It might be that he wants to be there to make certain, or it might be like Spike deciding “I’d better help her out” after convincing himself he should let Buffy die in “Once More With Feeling.” After such a detailed account of his thought processes up to the moment of the decision, it’s odd to lose that perspective…and we don’t get it back until after the flight through the sewers. The thought process in “Bring Him Home” is entirely hidden from the reader. Update: I have some more thoughts on this after reading it a third time. 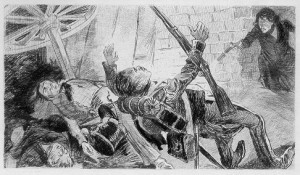 Gavroche, meanwhile, has an adventure on the way back to the barricade: breaking street lamps, stealing a cart (yes, he leaves a receipt), and singing at the top of his lungs until he almost gets shot by a patrol. The adventure of one small boy running amok has since entered the folklore of the neighborhood, remembered as a horrific nighttime attack. And that brings us to the end of Part Four! I may be able to finish this by the end of the year after all! Next: future revolt and overnight at the barricade. Pages covered: 953-984. Image by Jeanniot from an unidentified edition of Les Misérables, via the Pont-au-Change illustration gallery. This entry was posted in Book Commentary and tagged Barricade, Courfeyrac, Death, Enjolras, Eponine, Gavroche, Jean Prouvaire, Jean Valjean, Mabeuf, Marius, Paris, Revolution, Rue de l'Homme Arme on December 21, 2013 by Kelson Vibber.